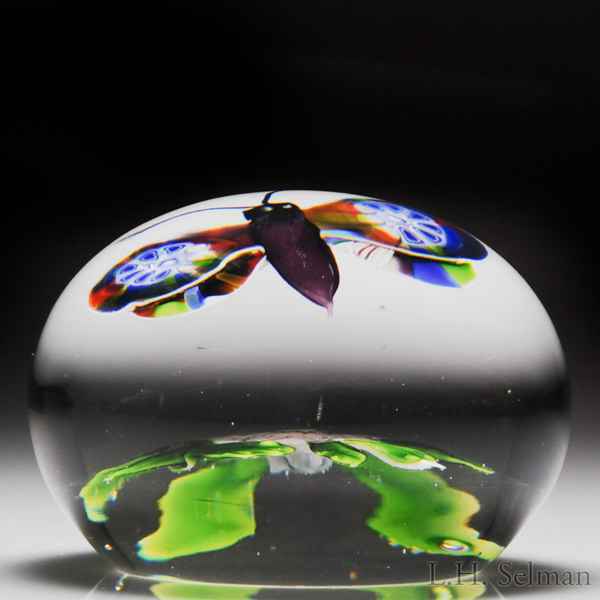 Very nice antique Baccarat millefiori butterfly over clematis paperweight. The butterfly, with turquoise eyes and four multicolored marbled millefiori wings extending from an amethyst latticinio body, hovers above a white double clematis with a red, green and white star center and white bud, framed by the bud and five radial green leaves. Clear, star-cut ground. "butterflies are placed above floral motifs encased in clear glass to create the illusion of their hovering in space."